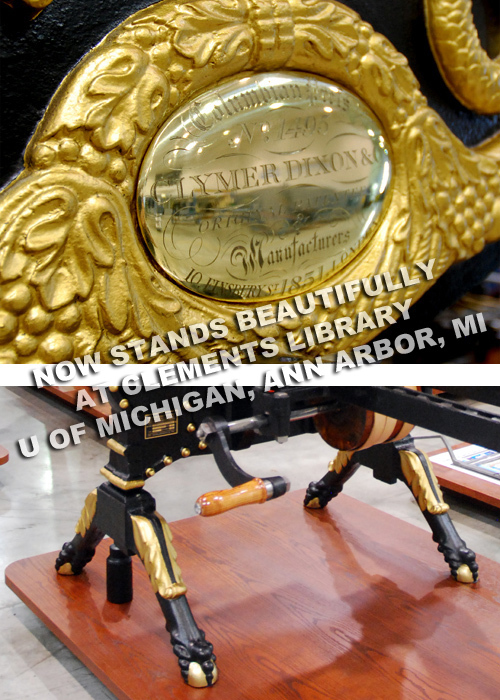 On April 11, 2016, after 2 1/2 years and an over $17 million dollar renovation, the Clements Library has re-opened. 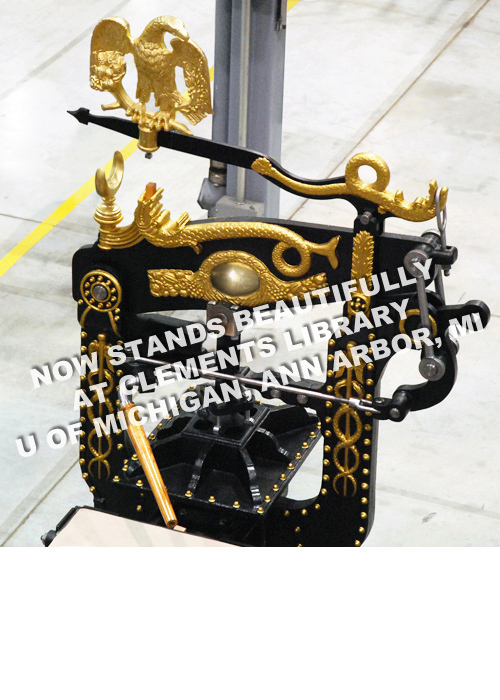 Besides the extensive 80,000 books and 30,000 maps, Clements now has another piece of history and as rare as some of the treasures on the shelves. 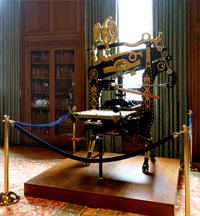 An 1851 George Clymer “Columbian” printing press - one of the most beautiful machines ever invented - sits proudly in the magnificent Avenir Foundation Room. 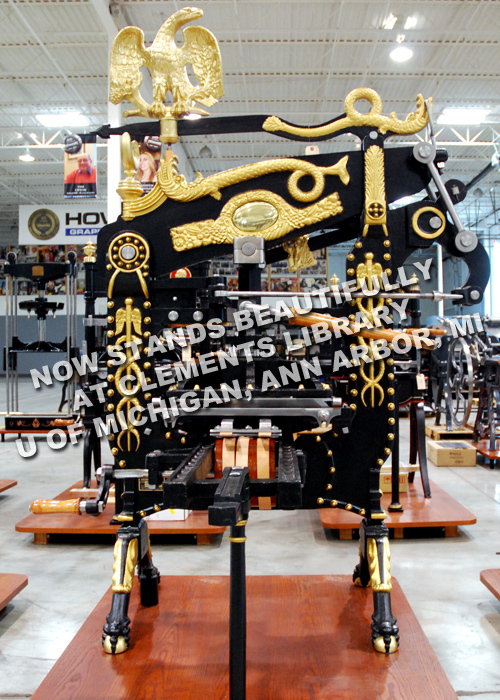 For good reason, it’s possible that even some of the books held could have been printed on such a press. George Clymer, an American from Philadelphia, was the creator of the Columbian. Adorned with a multitude of relief decorations, the purpose was for one to never forget his press. Apparently, Americans did. 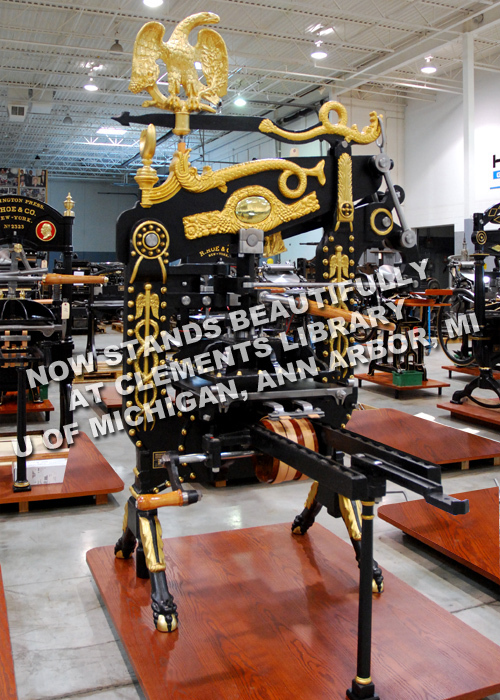 After Clymer started marketing the press in 1813, it fizzled, and at the age of 63 Clymer set sail for England where he re-established himself, patented his designs and went on to become the father of the very successful first all-iron printing machine. Our version represents the period after Clymer’s death in 1834.